There’s no doubt that Alien 3 was a false start, which makes Seven David Fincher’s launching pad, a film which instantly brought forth Fincher’s now signature visual style – slow meditative character films buried inside stimulating visceral subject matter and controlled and precise visual aesthetics. Seven is still a masterpiece of the serial killer genre, one of the only films that can legitimately stand beside the gargantuan Silence of the Lambs. At a glance the familiar hook of the Seven Deadly Sins might suggest something exploitative – a conceptual skeleton without much skin and bones on the outside. This is not the case. Seven is rich in character and theme, and those truly spine tingling impact moments the genre demands. In short, Seven has everything going for it. 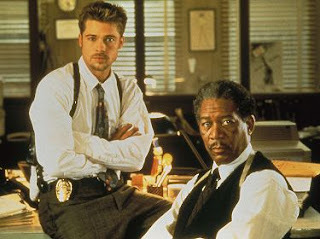 At its core Brad Pitt and Morgan Freeman make a dynamic duo. It’s a familiar introduction with Det. David Mills (Pitt), a hungry young newbie detective who purposely chooses the most vile police district in town to relocate to, and Det. Summerset (Freeman), a veteran who is literally days from retirement. Whether or not writer Andrew Kevin Walker purposely wrote in this played out cliché of the near-retired cop, it successfully disarms us to the calculated unconventionality of this film and the deeply cynical view on life presented to us. Of course, there’s a serial killer in town named John Doe who’s been killing people using the motivations of the Seven Deadly Sins. Whenever the men seem to get a break in the case it only leads to where the killer wants them to go. As such, we don’t even realize it until the end that the journey of the film is the killer's, leading our heroes into a trap so grandiose and diabolical, even after several viewings. The audience knows there’s going to be seven murders, and though we’re expecting them all one by one, we never feel any predictability in the journey. The first couple of murders are shot and edited with care showing the procedural duties of the cops. But as each new body appears Fincher doesn’t repeat himself and keeps the film moving at an increasingly aggressive pace. A few key action set pieces are magnificently choreographed. Namely, a remarkable chase sequence through the killer's apartment building and a siege sequence into what the detectives suspect is the killer’s lair. Each of these sequences is driven by the quietly pulsing rhythms of Howard Shore’s underappreciated but amazing score. Fincher is not shy to rip off the feel and tone used by Shore in his Silence of the Lambs score, or his work on the great Cronenberg movies of the ‘80s. The sounds are remarkably simple, slow and brooding ambient pulses that feel like jolts of energy guiding the film toward some kind of fire and brimstone hell. The arrival of that delivery truck down the desolate sun-streaked road in the desert and the painstaking reveal of that box and what’s actually in it indeed lives up to our expectations. It’s a truly earth shattering cinematic moment and the final stamp on one of the best films of the ‘90s. It’s arguably the best film of Fincher’s career and one of the best of its genre. Great review. This is one of the few movies that I revisit on a yearly basis and enjoy every time. You have nailed my thoughts and sentiments about this movie exactly. Seven is a terrific film and despite Fincher's usual visual stylistics is shot very classically without the 'point of view of the lightbulb' techniques he used in 'Panic Room and Fight Club'. Zodiac also employs a very disciplined technique as well. I have been slightly bothered over the years about the story logic at the end of the film. It is very clever at getting to the shocking ending but when I think about the clever John Doe I think he must have had another plan for Envy and Wrath. He did keep a man alive for a year in a bed after all. In the end it comes off as being a part of his big plan but he didn't encounter Mills well into his master plan and he is only forced to act once they discover his home. I like it as it is but the logic here does bug me and it feels like clever writing.